Tommy is a 25 year-old Manhattan Beach native who has been surfing for almost 15 years and teaching surfing for 12. He attended Mira Costa High School where he was Captain of the Surf Team then graduated from the University of San Diego where he was captain of the surf team for 3 of his 4 years. In 2005, Tommy won the NSSA Collegiate National AND State Titles in the Longboard Division. His surf travels include Hawaii, Bali, Mentawai Islands Indonesia, Bahamas, Baja, Mainland Mexico, Costa Rica, Florida, Virginia, Australia, New Zealand, France, Spain and Portugal. For more info about Tommy click here. Jason was born in Hawaii on the Island of Maui and has been surfing for 17 years. 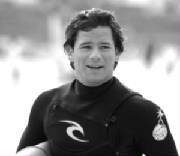 For the past 5 years, during the spring and summer months, Jason has been teaching surfing in Manhattan Beach. In the fall and winter he works as a Lifeguard and Boatman in Fiji at the famous island surf resort of Tavarua. Jason's surfing tavels include Europe, Indonesia, Central America, Fiji, and Africa. Jason is an awesome surfer and waterman with a passion for sharing his knowledge and love of the sport with others.